For round 2, we were paired with team Loonicorn, and after the matchup process figured out, I found myself paired with a very nice guy (and reader of this website, hi!) named Ethan. He had Syvestro in Magnum Opus with a bunch of tanks and a Vulcan paired with Gearheart. I knew 100% he was dropping Syvestro, and since those tanks are basically the best anti-tharn weapons in the faction I decided to drop Krueger. I lost the roll off and that meant going second. Side bar - I had forgotten how freaking obnoxious taking pictures of Storm Raptor games are. Syvestro starts things off by casting Transmutation on the Press Gangers and popping his +2 speed for constructs within 5 ability. His entire army screams up the field, with all the huge bases being speed 8 for a turn. I cannot really advance much this turn without getting blastered off the table. I think I played my Storm Raptor too cautiously, as it advanced a smidge, made three shots, and then dropped back. Going more to the left - staying out of melee threat of the Vulcan - but threatening more of the zone, would have been very important. I also think I played Una 1 far too conservatively this game in general. Dog Pile could have been clutch as a threat extender, allowing the Raptor to alpha the Vulcan and hopefully drop it. Regardless of how the game ought to have been played, I bubble wrapped Krueger with shield guards/sac pawns and sort of scootched up a bit without committing to any particular place. The response is pretty measured. Press Gangers mini-feat and run up, leaving a spray lane for the Railless on the right. It does a few damage to the Pureblood, but nothing major. The Vulcan moves up and does some more damage with the sprays, and then tries to deviate an AOE onto the Pureblood which I shove into his own Press Gangers thanks to Windstorm. I am able to Telekinesis the right hand Railless close enough for the Pureblood to assault in. Unfortunately, the Pureblood is not a very hard hitting beast, and the battle engine survives on a few boxes. Krueger feats this turn and just camps six rather than opting to put Windstorm up again, which I think was another mistake on my part. The Raptor continues to blast away at the left Railless, leaving it on about 10 boxes after a second round of shooting. 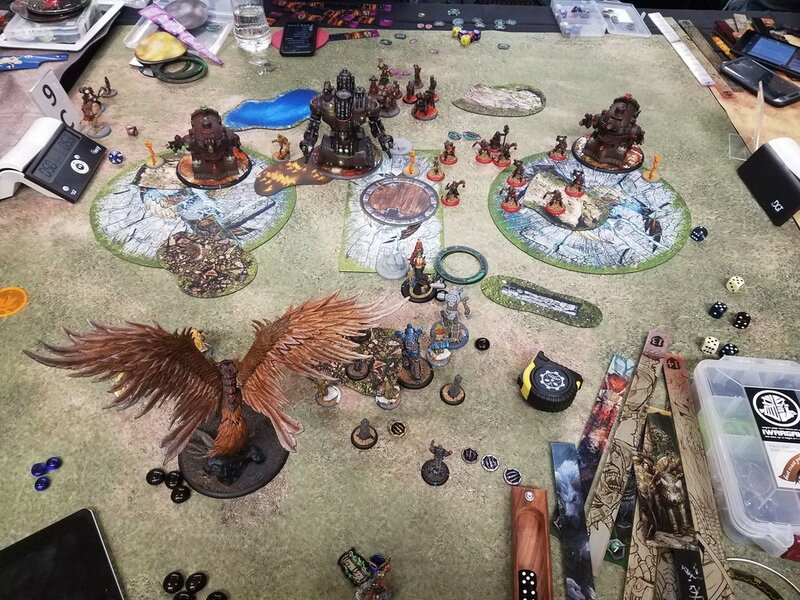 Ethan capitalizes on my cagey playing by feating and clearing all of the zones of any contesting models, whilst also leaving Syvestro perfectly safe in his cloud bunker. Trancers fail to kill the Woldwarden in the right zone, but they do successfully slam him out. Ethan scores 4 points here. I have to kill the Vulcan this turn or I have literally no chance. 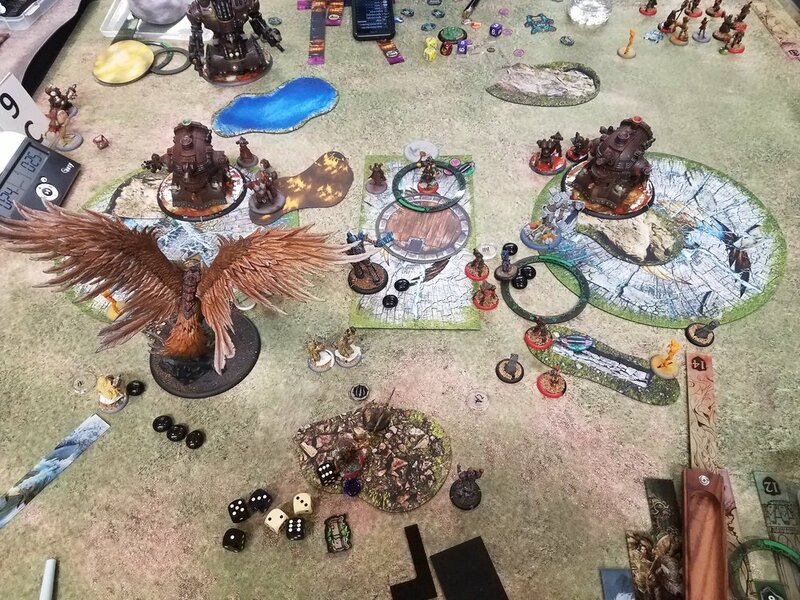 Between Storm Raptor shots (and a reposition into the left zone) and a Strength buffed Woldwarden the colossal goes down. Unfortunately, I cannot contest the right hand zone with very much, but if I can survive this turn I am in a great place attrition wise. Sadly, my hopes are dashed by an ambushing Hutchuk who comes in and takes out the Shifting Stone, and Syvestro kills off the Warden with spells before anything else activates, getting Ethan one final point and the game! Losing that die roll for first was huge, as the line of engagement was such that I could never get into the zones in a meaningful way. I also think I probably played too passively with my caster - I could have baited an assassination run and potentially been okay with the number of sac-pawn targets I had. Ethan played a very good game, and his team went on to crush us 4 - 1 and make it all the way to the finals against Canada Beaver! Nicely done man! Tune back in soon for round 3, the first of several Circle mirrors.